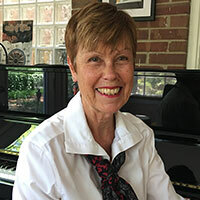 My name is Lorna Collingridge and I teach piano primarily, but also voice, ukulele (especially to younger students), guitar, music theory and musicianship, and composition. I am Australian by birth, but came here to Durham 18 years ago to finish my PhD at Duke. Like many others before me, I found employment, became a citizen, married my partner, and stayed! I have two daughters and three grandchildren unfortunately living a long way from here, one family in London, the other in Fremantle, Australia. I have taught music most of my working life, in the classroom (PK – 12), and privately, apart from some years in Real Estate and seven years teaching in the higher education sector in Brisbane. I began my studio, Flourishing Muse in 2008 and consistently teach between 35-40 lessons each week. I am so happy to be able to pass on my skills and love of music to all ages, from 6 year old students to 80 year old adults! You can read more about my experience at www.lornacollingridge.net, but about my more recent activities here on my blog.